Summer is coming! The days are getting longer, the nights are getting warmer and our appetites are getting bigger – this can only mean one thing – al fresco dining! Having a barbecue is the perfect way to prepare a delicious and fuss-free dinner outside during the summer. Barbecuing has always been a popular way of cooking food in Australia, because food cooked over a flame lends itself to a delightfully charred and smoky flavour that you simply can’t substitute. Traditionally, we have barbecued sausages, hamburgers, steaks and kebabs but these days more and more Australians are getting adventurous with the types of foods they cook on their hallowed grills. Kofta, satay pork and kangaroo are some of the things that are finding their way onto the barbecue, along with scallops, calamari and vegetables such as corn, asparagus, zucchini, eggplant and sweet potato. Why not try it for yourself? Check out pp 300-321 of The Food Book for great barbecuing recipes and ideas. But here is a delicious barbecued asparagus recipe to help kick-start your barbecue. It’s straight-forward to make and only needs items commonly found in the pantry, so you can easily add it to your repertoire of barbecued foods. Drizzle oil on asparagus and place on hot barbecue plate. Cook for 3 minutes and then season with salt and pepper before serving. Another delicious asparagus recipe with a few extra ingredients is described below. It sure beats the traditional sliced onions and potatoes on the barbie! Drain marinade and place asparagus on hot barbecue plate. How do you like to spend these long summer nights? 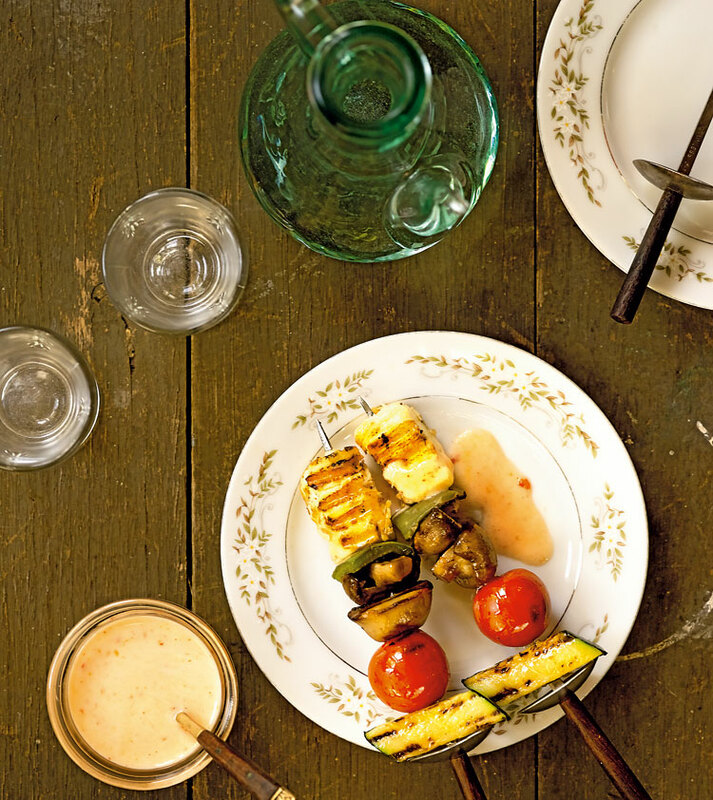 Do you have a favourite barbecue recipe you’d like to share? We’d love to hear from you! It’s Spring Racing Carnival time! Even if you are not a race goer, it’s still spring and that means it is time to be outdoors! 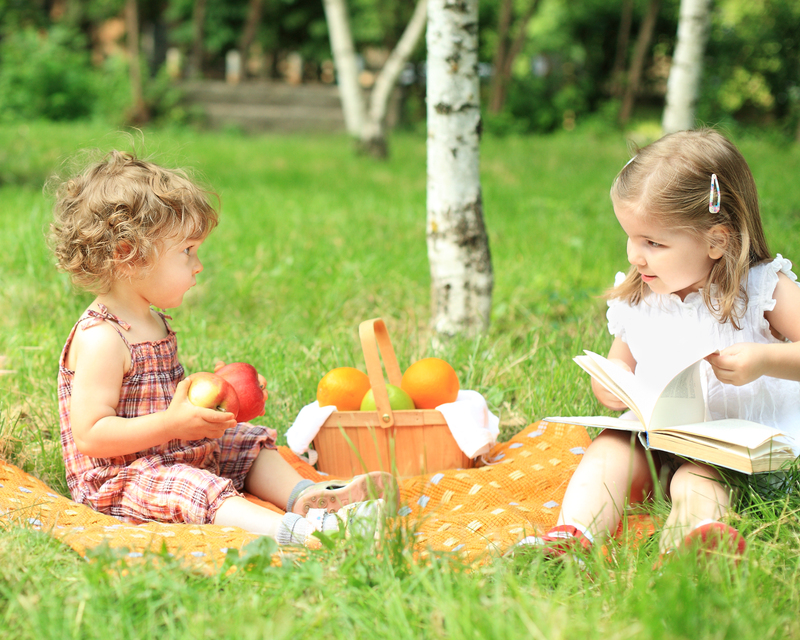 The weather is perfect for packing a picnic, whether it’s to your local park or for a day out at the races. There are lots of delicious and simple-to-prepare dishes that you can make which will only need one hand to consume – leaving the other free to hold a book, a fishing rod or even a glass of bubbly. One idea is to make the Layered Picnic Loaf on p. 156 of The Food Book. Consisting of a whole loaf of bread hollowed out and filled with layers of tasty ingredients – it is the perfect picnic fare. Another idea is the open sandwich – the topping possibilities are endless – you can have beans and artichoke; smoked salmon and avocado; or even pear and blue cheese. For even more suggestions have a look at pp. 154-155 in The Food Book. Spring is also time to try some new recipes. Have you tried making capsicum and cheese bites? They are simple to make and can be easily stored. Combine pesto, cream cheese and ricotta cheese together and set aside. Cut both the red and yellow capsicums lengthwise into 2.5 cm strips. Cook capsicum strips under a hot grill until skin blisters, and then remove and cover with plastic wrap until they cool. Peel away the skin and discard. Place the capsicum strips on a chopping board and position a basil leaf in the centre of each strip. Place approximately one teaspoon of pesto mixture end of each capsicum strip and roll up and secure with a toothpick. 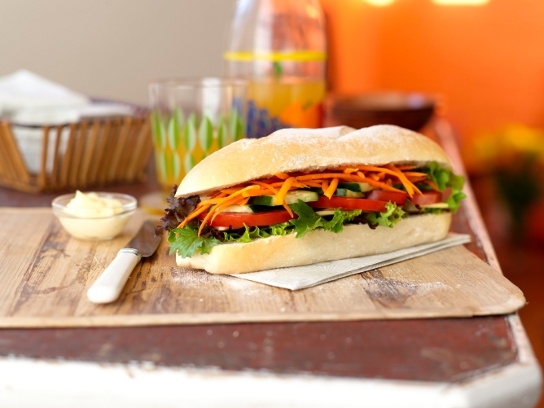 What simple ideas do you have for foods to pack for the Spring Racing Carnival or to take on a quiet picnic? With spring in the air, we should take advantage of the bountiful crops of juicy citrus fruits that are now ready to be picked and made into some delicious goodies! Lemons are a w onderful fruit. We usually associate it with deliciously tangy desserts, but did you know that it can also be used in a variety of savoury dishes? Lemons go very well with ingredients such as avocado, seafood, chilli, mint and salad leaves — have a try at some of these flavour combinations yourself! A sumptuous lemon curd is also very easy to make — it is simple, yet can make an impressive and delicious gift when poured into a jar and tied with a ribbon. Lemon curd can be used as a topping for pikelets, pavlovas or pancakes; a refreshing spread between cake layers; on English muffins or toast. You can even use it as filling for shortcrust pastry tartlets and top it with raspberries — absolutely delicious! Try out the simple lemon curd recipe on p.444 of The Food Book. 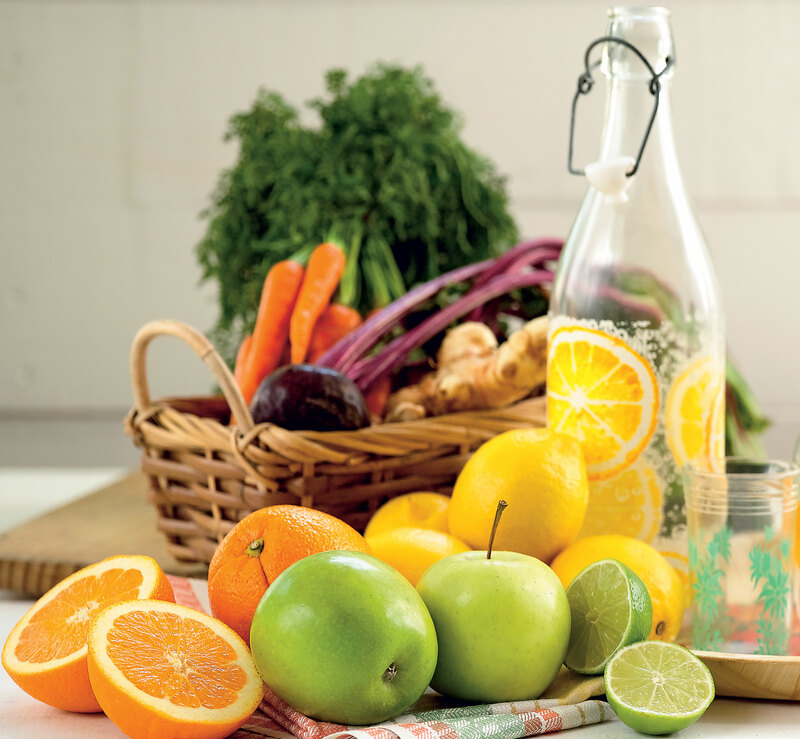 You may also substitute lemons for oranges or mandarins for something different. Place juice of limes and lemons, water and caster sugar in saucepan and cook over a low heat for 5-6 minutes or until sugar is dissolved. Pour mixture over sliced lime and lemon in jug. Refrigerate for four hours or until chilled. To serve, pour over crushed iced and sprinkle with mint leaves. 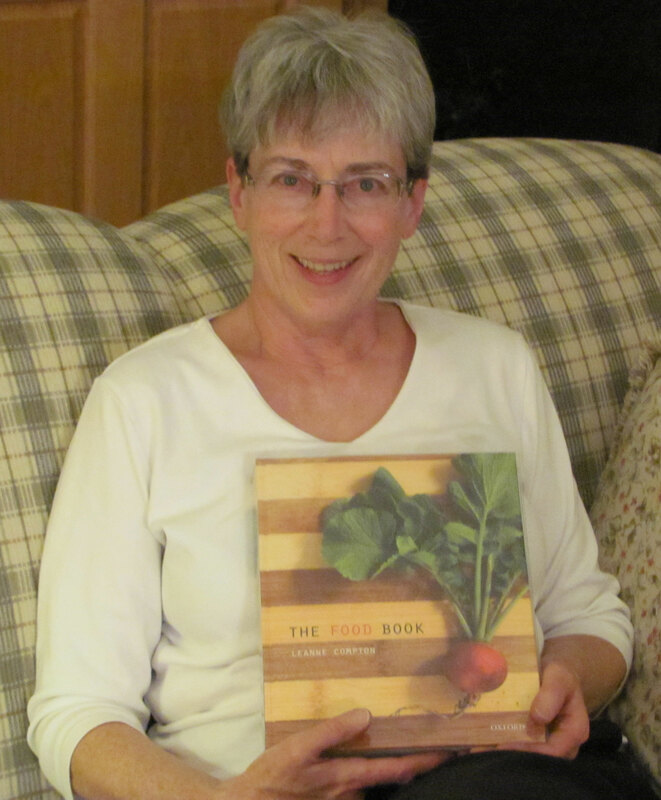 Rose Kastl, a retired home economics teacher from Nebraska in the United States, loves her copy of The Food Book! She was also kind enough to share some of her thoughts with us. I have been reading and trying some of the recipes from The Food Book and found it very informative and interesting to read. I have learnt so much about the intricate little differences in our language when it comes to food. For example, I had to look up caster sugar because I had never heard of that term before – and was surprised to find that it is just very fine granulated sugar! Also, desiccated coconut is just dried coconut without the sugar and oil added, which is commonly in use here in the US. The pictures of the different fruits, vegetables, meats, etc. are also very helpful. The book is a great encyclopaedia as well as a cook book. It has been so much fun reading and using it this year. My sister, who has Alzheimer’s, sat down and looked at it at length – then almost took it home with her! She can’t use it because she isn’t able to cook anymore, but she really enjoys looking at it when she is here with us. 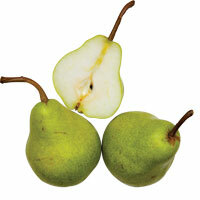 Poaching is a great way to preserve fruits that are in season, and nothing beats a mouth-watering poached pear. Pears have a more buttery and grittier texture than cooked appl es — you will find a variety in season during winter such as the Packam, Williams and the Bosc pear. This recipe serves four. Bring to the boil over a medium-high heat and boil for three minutes. Reduce the heat and add two peeled, halved and cored pears and simmer for 20–30 minutes or until tender. Remove pears from the syrup and chill them in a refrigerator. Serve with cream and/or ice-cream for a lip-smacking dessert. Very ripe pears will break down quickly when cooked so it is best to use just-ripe pears for this recipe as they will keep their shape. If you are looking for a more decadent dessert, try the Free-form Pear and Chocolate Tart on p. 423 of The Food Book. 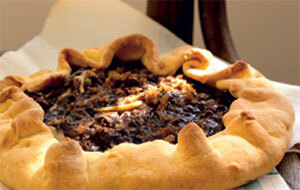 Free-form tarts are more rustic than traditional tarts as you make it without a tin. This recipe uses a sweet shortcrust pastry and showcases skills such as kneading, whisking, rubbing in, slicing, rolling out and baking. The end product is always a winner with children and adults alike! What ideas do you have for pears? We would love to hear about your recipes whether it be a simple salad or something more complex. Mother’s Day is celebrated on every second Sunday in May in Australia. It is a special day for families to get together to show their love and appreciation for their mums. There are many ways to show this, a crowd pleaser is the luxurious breakfast in bed option — a treat we all know is a sure-fire winner. The Food Book has lots of ideas for breakfast, from the Simple Fruit Salad (p. 126) — using fruits that are in season — to hearty and nutritious Baked Beans (p.141) and scrumptious, No-fail Pancakes (p. 130 with ideas for variations on p.131). Eggs are a healthy and savoury option, boil them, fry them, scramble them and poach them (p. 134 -136). 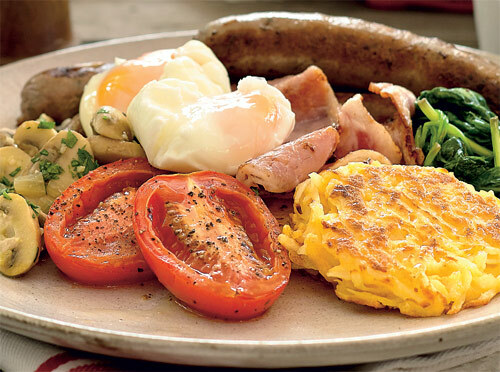 Or for those with plenty of time, OR (hint) helpers, try The Big Breakfast (p. 142-143) which includes Poached Eggs plus the following recipes: Hash Browns, Grilled Sausages, Grilled Bacon, Garlic Mushrooms, Grilled Tomatoes and Wilted Spinach that will keep your Mum going until well into the afternoon! The Food Book app has step-by-step photos for these breakfast recipes – download a copy on your iPad for a sure-fire way to your mum’s heart on Mother’s Day – through her stomach! 🙂 What ways are you going to show your love and appreciation for mum this Mother’s Day? Do you have a special treat you are going to make? Easter, a festival in the Christian calendar, is almost here and there are lots of great treats to make. Hot Cross Buns are a favourite of many. 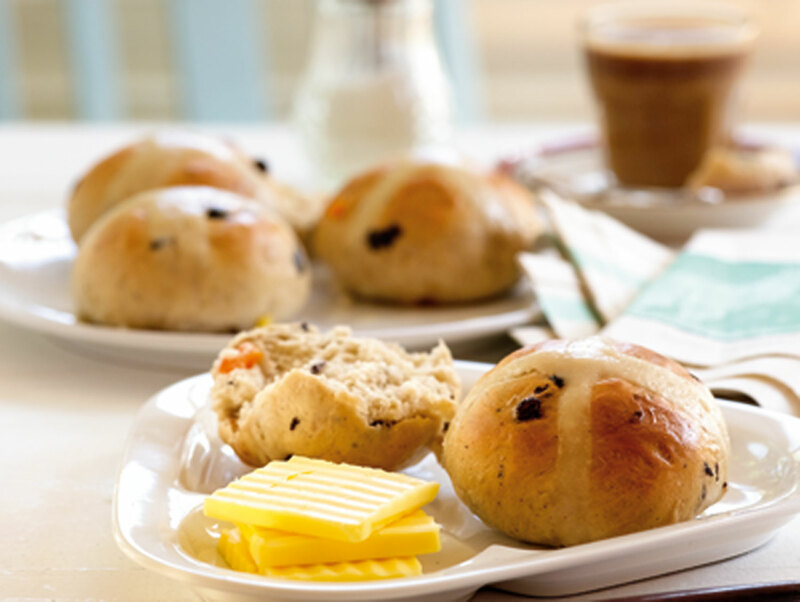 These buns are traditionally eaten hot or toasted on Good Friday, with the cross standing as a symbol of the crucifixion. There is a great recipe for Hot Cross Buns on p. 408 of The Food Book. While cooking with yeast can be quite daunting for some, it is not too difficult, and the feasting on home-made Hot Cross Buns makes it all worthwhile! You can easily substitute the currants for dried cranberries – a delicious, tangy alternative. For the non-traditionalists, replace the dried fruits with chopped up chocolate for an extra decadent treat. Chocolate is also synonymous with Easter. There are lots of chocolate treats that you can make at Easter. What are your favourites? Many people make homemade Easter eggs or you could select any of the scrumptious chocolate recipes from The Food Book. Try the Rum Balls (p. 376), Chocolate Truffles (p. 377) or the Brownies (p. 388) as an easy-to-make and very impressive treat. If you want a super-quick chocolate treat, make the Hot Chocolate drink on p. 457. Cook scallops on barbecue for 1-2 minutes until golden and turn over and cook for another minute. Serve immediately with salad for a mouth-watering treat. What other seafood ideas do you have for Good Friday? Or do you have other much-loved recipes for Easter? World Home Economics Day: How did you celebrate? World Home Economics Day (WHED) is celebrated annually around the world on March 21. It is a day to celebrate the home economics profession and its contribution to individuals, families and communities around the world. This year the theme for WHED was Home economics empowerment: Education for a sustainable lifestyle. The aim of sustainable development “… is to help people to develop the attitudes, skills and knowledge to make informed decisions for the benefit of themselves and others, now and in the future, and to act upon these decisions” (UNESCO – Education for Sustainable Development). In Ghana last year, WHED was commemorated by a cooking competition among selected senior high schools as well as a four kilometre health walk followed by a health talk on HIV/AIDS. In Australia, many WHED celebrations were held in conjunction with King and Amy O’Malley Trust presentations to recognise leadership abilities in undergraduate and postgraduate home economics students. At a school level, many teachers had displays acknowledging WHED and promoting home economics education. How did you and your students celebrate WHED this year? What activities did you organise to mark this special day? Home Economics Victoria is a partner in the new government initiative involving Jamie Oliver’s Ministry of Food Victoria. Have a look at the announcement from Carol Warren today. Here’s to looking forward to new and exciting initiatives for Home Economics teachers around Victoria! We are very pleased to tell you about our new project announced yesterday by the Minister for Health, David Davis as part of the Victorian Healthy Eating Enterprise. As you no doubt would have seen in the media yesterday, this new initiative includes Jamie Oliver’s Ministry of Food Victoria. Home Economics Victoria will be able to have a number of staff devoted to this project over the next few years to work directly with you in secondary schools. We know that you are doing a great job in schools and this project acknowledges your commitment to healthy eating and practical cooking skills. Stay tuned for more news over the coming months. It’s back to school for many children – one of the challenges is to provide healthy, tasty, easy-to-prepare lunches that are suitable for the warmer weather. Sandwiches are often a typical choice for school lunches, but this doesn’t mean it has to be a boring choice. There are lots of different types of breads to select from – consider using baguettes, lavash and tortillas (there are a range of different bread options on p. 71 of The Food Book). Fillings for sandwiches are up to your imagination. 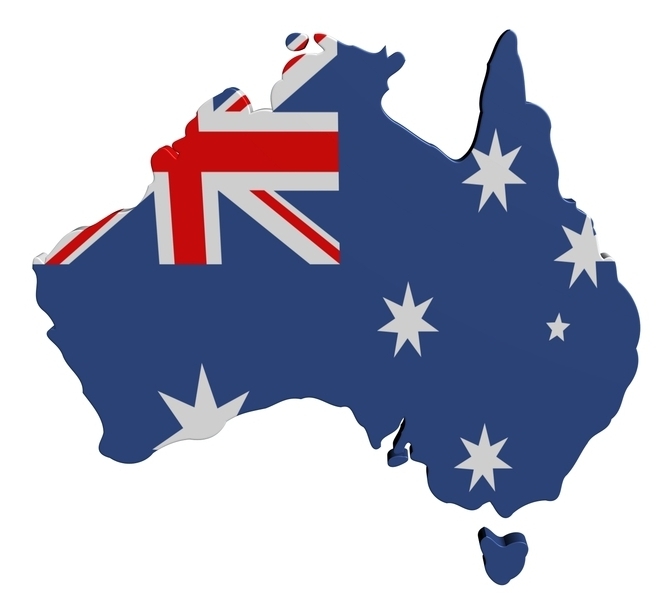 January 26 is Australia Day – a public holiday that commemorates the establishment of the first settlement at Port Jackson in 1788. The settlement was later named Sydney after British Home Secretary, Lord Sydney, who was responsible for the colony. There are no hard and fast rules about how to celebrate Australia Day, but generally it is seen as an opportunity for Australians to come together to celebrate their country and culture, and we typically include food in our celebrations. Lamb is synonymous with Australia Day –the anticipated spruiking by Sam Kekovich about how we should consume lamb on Australia Day took an unexpected twist this year when he reminded us through song the song I’m A Barbie Girl. Check out the range of lamb recipes mentioned in the September post for meal ideas. Bananas are definitely back on the shopping list as their prices have finally come down. The high prices were due to the devastation that Cyclone Yasi caused to banana crops in Queensland last year. It has been quite a while since bananas prices were this low, so it’s the perfect time to include them on your menu, not only because bananas are inexpensive at the moment but because they are a versatile ingredient in a range of sweet and savoury dishes, adding richness and texture. 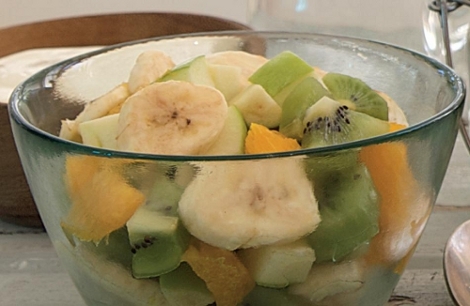 Add some sliced banana to a fresh fruit salad – they offer a distinctive texture when compared to other fruits. Try the Simple Fruit Salad on p. 126 The Food Book or make up your own recipe with your favourite fruits – you can’t go wrong. Cooking is one of life’s great skills, and now the holidays are here there is no better time to encourage kids to start. 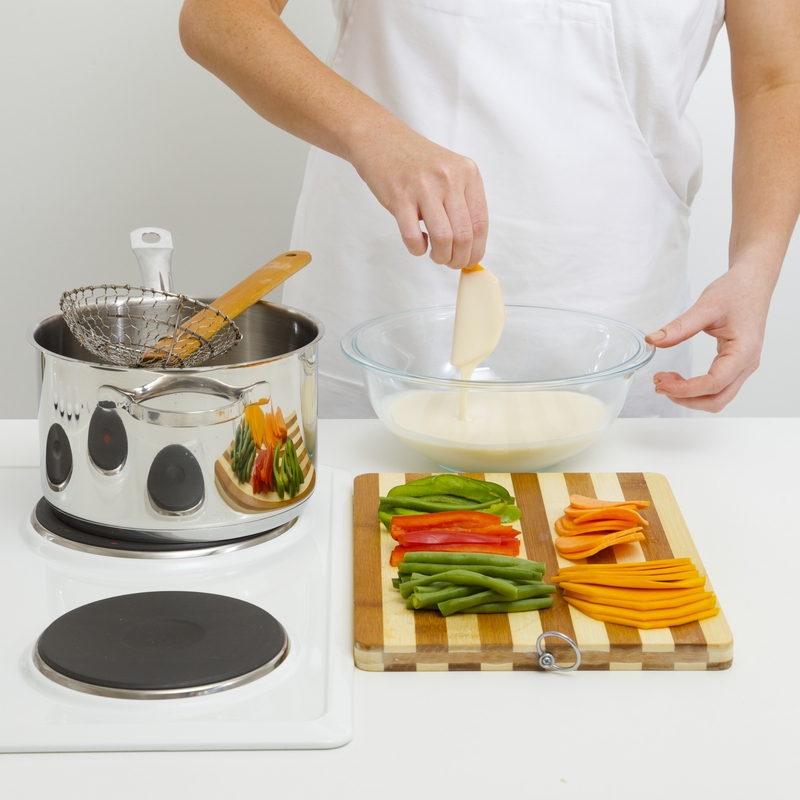 Not only will cooking entertain children for ages, you will also get some great foods to taste. Why not try making some of these recipes from The Food Book. With a little bit of encouragement and supervision, your children can make a delightful range of goodies.